Crafting Queen: Superhero Theme Birthday Party!! Super happy to share this post! This one is yet again close to my heart. Its so much fun when clients trust my judgement on the designing front. It lets me come out with the best ideas! 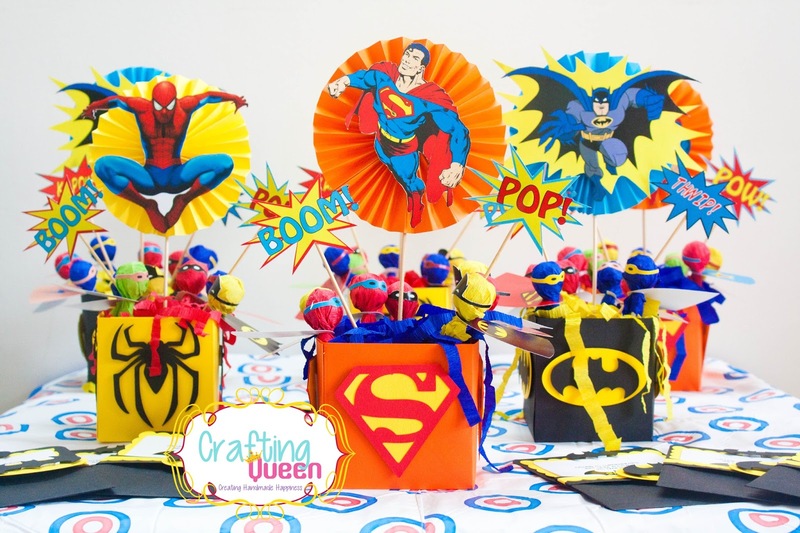 so the birthday theme for a 6 year old was superheros! 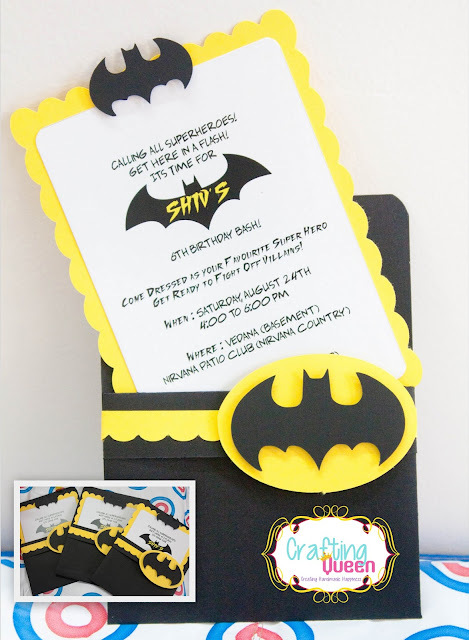 so we decided to keep the invites focused on Batman theme and since they wanted table top centers to deck up the venue i suggested to have more Heroes and more colours! I did look around for some inspirations and so i cant take all the credit for everything here. But i had so much fun planning and executing it and had some great feedback as well. 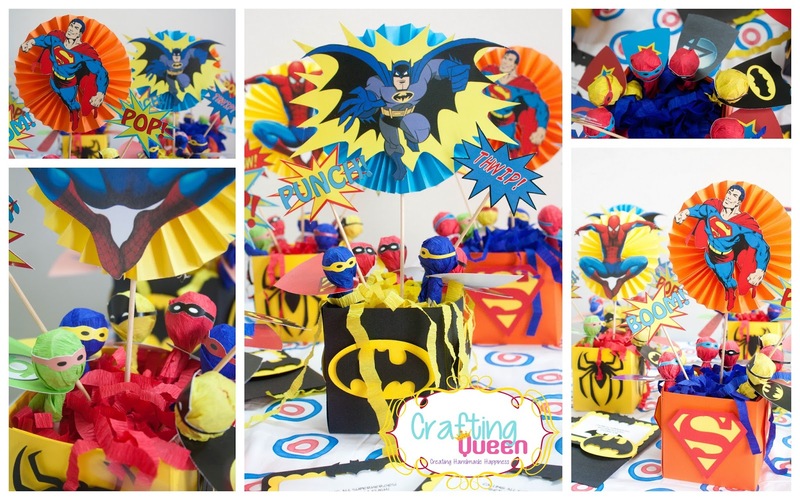 "Karuna helped me with s superhero theme party for my son's 6th Birthday. 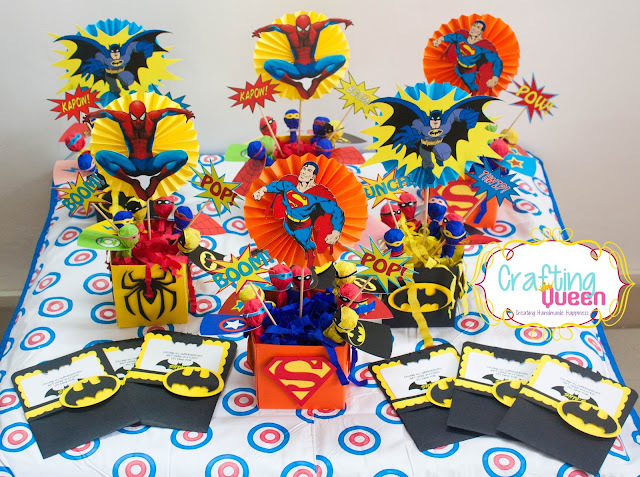 The birthday cards, table decor and superhero lollypops were such a hit! The colours, and eye for detail were amazing. all the kids were crazt about the lollypops and so was my son. I would encourge folks to try out her work. I should have gotten Karuna to decorate and do up craft work for my sons room - next time for sure." Here are the pics! Will be happy to hear some feedback. This is fabulous. Especially love the lollipops dressed up! Wonderful idea and love the bright colours used without looking tacky.The lollipops dressed as superheroes is pure genius and love the bat symbols too.Did you fussy cut them?